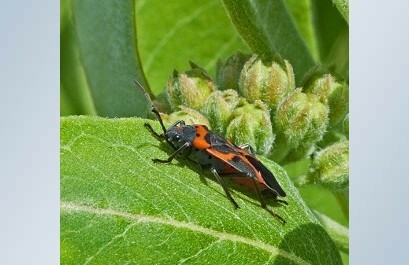 New Small Milkweed Bug (Lygaeus kalmii) Stock Images. Kingston Photographer Ernie Hunter has just published a new set of Small Milkweed Bug (Lygaeus kalmii) photos.These bugs are one of several to live on toxic milkweed.The Monarch Butterfly, Large Milkweed Bug and Milkweed Beetles all consume parts of the milkweed with no ill affects.They all share the same bright orange/red and black warning colours, telling predators to leave them alone. They don't taste good. Eggs are laid on milkweed in the spring. The nymphs look like the adults more as they develop through several instars. Identified by the "X" on their wings, created by the black and orange bands. Check out more amazing photos from Ernie Hunter here.